RUFFORD, a village and a parish in Ormskirk district, Lancashire. The village stands on the river Douglas, near the Liverpool and Preston railway, 5½ miles N N E of Ormskirk; is a seat of petty-sessions; and has a station on the railway, a post-office under Ormskirk, and a cattle fair on 13 May. The parish contains also the hamlet of Holmes-Wood, and comprises 3,102 acres. Real property, £6,185. Pop., 865. Houses, 149. The manor and most of the land belong to Sir Thomas G. Hesketh, Bart. The New Hall is Sir Thomas' seat; and the Old Hall is the residence of the Dowager Lady Hesketh. The living is a rectory in the diocese of Manchester. Value, £495. Patrons, the Representatives of the late L. Starkie. The church is of brick, with a bell-cupola. There are an endowed school for girls, a school for boys, and charities £22. Local studies information is held at Ormskirk and Skelmersdale libraries. Details about the census records, and indexes for Rufford. You can also perform a more selective search for churches in the Rufford area or see them printed on a map. The Register Office covering the Rufford area is West Lancashire. Ask for a calculation of the distance from Rufford to another place. "RUFFORD, a parish in the hundred of Leyland, county Lancaster, 5 miles N.E. of Ormskirk, its post town, and 12½ S.W. of Preston. It is a station on the W. section of the Lancashire and Yorkshire railway. This place, formerly a chapelry in the parish of Croston, was made parochial by Act of Parliament. The village is situated near the Leeds and Liverpool branch canal and the river Douglas. It is intersected by the high road from Preston to Liverpool. Petty sessions for the division are held at the Hesketh Arms monthly, in rotation with Chorley, Cuerdon, Leyland, and Penwortham. The land is nearly evenly divided between arable and pasture, with a small tract of heath and common. The tithes have been commuted for a rent-charge of £390, and the rector receives £190 out of those of Ulnes Walton. The living is a rectory in the diocese of Manchester, value £495. The church, dedicated to St. Mary, is crowned by a cupola containing one bell. The interior of the church contains monuments and effigies of a knight and his lady. The parochial charities produce about £22 per annum. There are National schools for both sexes, supported by Lady A. Hesketh and Sir T. G. Hesketh, Bart. The principal residence is Hesketh Hall." 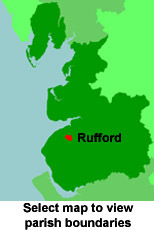 You can see the administrative areas in which Rufford has been placed at times in the past. Select one to see a link to a map of that particular area. View maps of Rufford and places within its boundaries. For probate purposes prior to 1858, Rufford was in the Archdeaconry of Chester, in the Diocese of Chester. The original Lancashire wills for the Archdeaconry of Chester are held at the Lancashire Record Office.